It’s finally pizza night, but you’re feeling too lazy to drive all the way to your local spot for pick up and you don’t want to pay extra for delivery. What’s a pizza-lovin’ San Diegan to do? 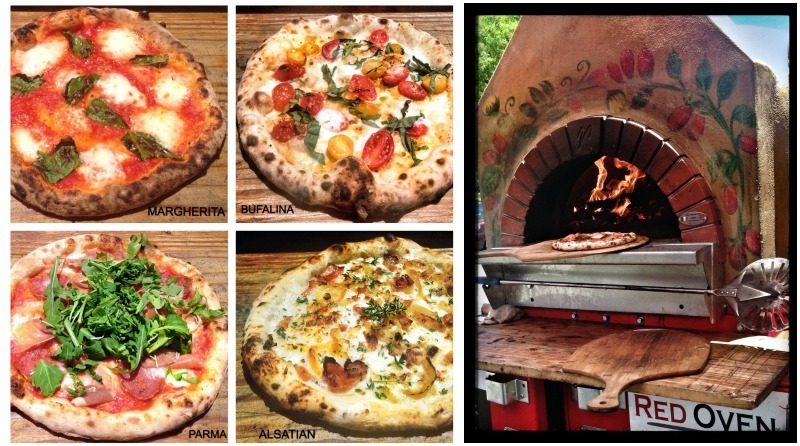 See where Red Oven Pizza’s food truck is at, of course! Inspired by Napoletana and Alsatian pizzas originating from Italy, Red Oven Pizza uses only fresh ingredients, hand-crafted dough, and their own special Italian wood-fired oven. You can choose from their Napoletana menu options or opt for the classics: cheese, pepperoni, or meat lovers. They also have a small variety of sides such as salads or garlic breads. Here’s a primer on Napoletana-style pizzas: the process starts with the ingredients, importing all the top shelf cheeses, prosciutto, flour, and oils from Naples so you can enjoy an authentic pizza as if you ordered it from a Napoli pizzeria! The end result is simply delicious, with the right combination of warm, melted cheese, soft baked crust, high quality vegetables and your choice of either homemade Marinara, Margherita, or Margherita Extra sauce. So next pizza night, keep your eyes peeled for the Red Oven food truck!